Having moved to New England from Hawaii, I am always curious to see what artifacts have made it across land and sea before me. Here at WAM I was delighted to find a 19th century travel album featuring photographs taken on the island of Oahu. Many travelers from Europe and America stopped in Hawaii on their way to East Asia, purchasing images of places they visited from commercial photographers. 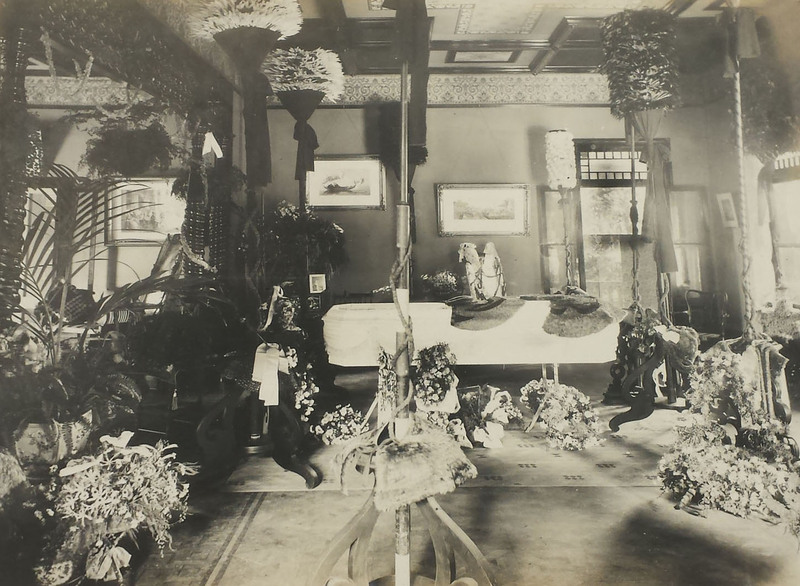 The album in our collection is one of two that record an 1899 trip made to China and Japan by Frances Clary Morse, the founder and first president of the Worcester Garden Club. The last decade of the 1800s was a contentious time in the islands, as the Hawaiian monarchy was overthrown and Hawaii was annexed to the United States. Morse brought documentation of these events back to Worcester in two images, both by Frank Davey, a British photographer who had a commercial studio in Honolulu from 1897 to 1902. 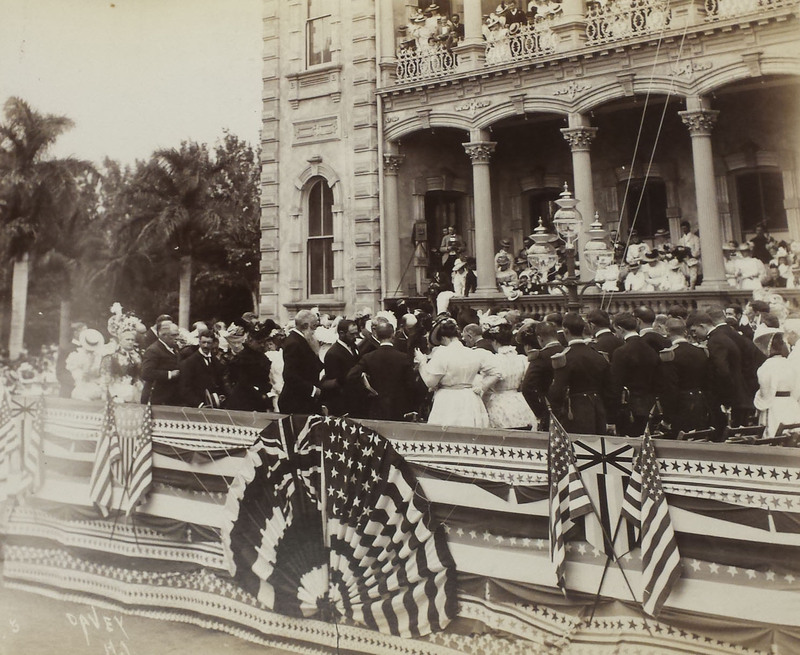 The first photo was taken at the Annexation ceremony on August 12, 1898, when Hawaii formally became a territory of the United States. Standing above the unified flags of Hawaii and the US are Sanford B. Dole, President of the Republic of Hawaii (in profile with a long white beard), and Harold M. Sewall, US Minister to Hawaii (to Dole’s right, back to the camera). Although the photograph shows a large crowd at ʻIolani Palace, Native Hawaiians were noticeably absent that day, as many Hawaiians, including the royal family, locked themselves away within their homes in protest of the transaction. This mourning of the Kingdom of Hawaii is captured in a solemn photograph of Princess Kaʻiulani lying in state at ʻĀinahau, her royal estate. Kaʻiulani was the Crown Princess of Hawaii, and when the monarchy was overthrown in 1893 she traveled throughout the US to protest the deposition of her Kingdom. The princess was much beloved by her people and after her death on March 6, 1899, her body was surrounded by flower arrangements and kāhili, the feathered standards of Hawaiian royalty. Although these photographs were taken over a century ago, they reverberate with relevance today. Sovereignty movements continue to exist throughout the islands and many Hawaii residents, native and non-native alike, support the idea of secession. Frances Clary Morse preserved powerful statements about the history and culture of Hawaii when she placed Davey’s photographs in her travel album. So, on this World Photo Day, I encourage you to keep snapping those vacation pics - who knows what important events you might capture!